Select a buyback option, fill out an equipment form, get paid — it’s that simple. 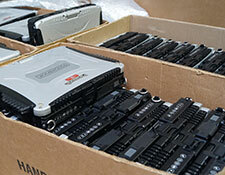 Do you have surplus IT equipment due to downsizing, moving, merging or relocating? We have an established network of buyers ready to purchase your retired notebooks, desktops, laptops, servers, networking gear, telephony, POS equipment etc. at prices well above wholesale. We provide a full chain of custody for these IT assets, guaranteed payment without consignment and no financial risk to you. 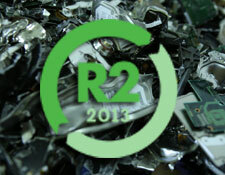 All assets that cannot be resold will be recycled adhering to the R2:2013 certification standard. Did you know the greatest risk of a data breach occurs during technology disposal? At e-Waste, we safeguard you from data loss while also protecting you from the potential financial and legal penalties of a data breach. Our certified data erasure services are fully compliant with heavily regulated industries like healthcare, finance and insurance, as well as and government agencies who have strict guidelines regarding the handling and disposal of confidential data. We insure our clients up to $2 million per incident. Asset retirement can be a complex challenge. Often it takes multiple vendors to handle shipping, packaging, storage, inventory, data destruction, logistics, disposal and recycling. With our innovative “e-Crate” system, simply place your electronic equipment into the e-crate container we ship to your door. We’ll take it from there..
Why worry about inventorying, testing, erasing data and shipping your computers or other electronic equipment back to a leasing company. We’ll manage the entire process from start to final destination with an easy leasing solution that is as cost effective as it is simple. 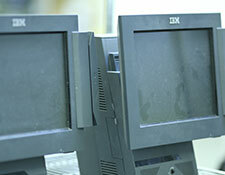 There are serious financial, logistical and legal burdens associated with retiring large quantities of old IT assets. 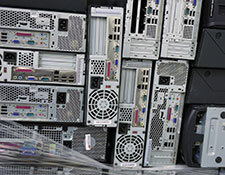 At e-Waste, we shoulder these burdens for you, delivering a complete audit report, a certificate of destruction and a letter of indemnification verifying that all your sensitive data has been completely destroyed and all materials disposed of in compliance with any applicable regulations. In addition, we safeguard our clients by insuring them up to $2 million per incident for improper disposal. Not ready to upgrade your equipment? Refurbishing used technology assets and redeploying them across your organization is a cost-effective and increasingly popular option. 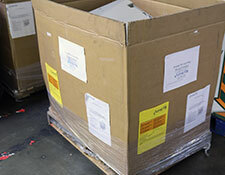 We’ll collect, sanitize and refurbish your legacy equipment, then redeploy it to the destination of your choice.